These Cheesecake Stuffed Strawberries are a taste true indulgence filled with a smooth cream cheese concoction. 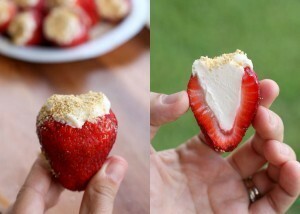 Sweetened cream cheese prettily piped into strawberries then dipped into graham cracker crumbs is a tasty finger food appetizer that is always a huge hit at any party or pot luck. They are simple to prepare, delicious to eat and come in the prettiest presentation. I have to admit that it has become my favorite dessert when I have a sweet tooth and just a bite of something sweet. LOOK below the ad banner to see the article. Visit us on Facebook, Pinterest, Twitter, Google + , Homesteading Learning Interactive Group or send an email to [email protected] to join our single daily email that contain all of that day’s articles.